This is my labradoodle. She is a good girl, but has a bad habit of eating things that belong the twin 5-year-old boys. 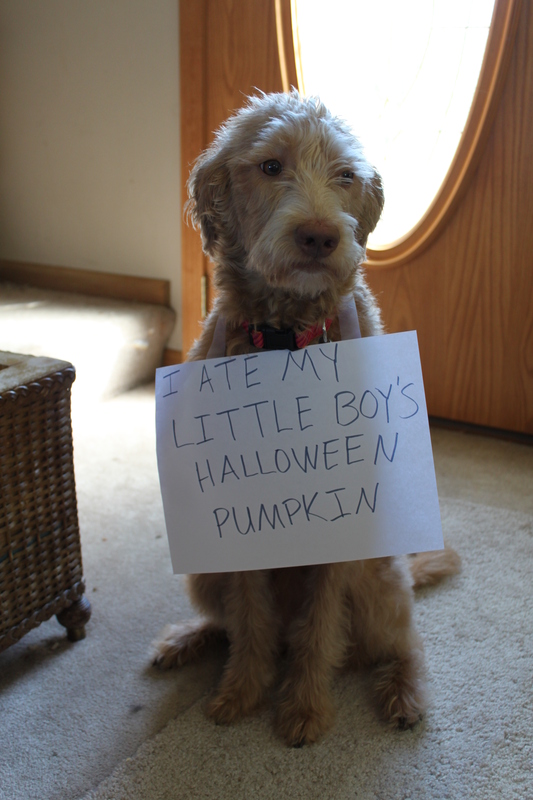 The pumpkin was by far the weirdest thing she has eaten, but she also has a fondness for eating the faces off their stuffed animals. So much so that she has been known to poop out stuffing! That is a beautiful dog! I would have to forgive her! Pumpkin is used to bind stools. Your adorable pup might be very constipated over the next few days!!! She looks very, very sorry. And absolutely adorable!! She is the sweetest looking dog ever!! With a face like that she can never EVER do wrong AND you know it!! !